You have probably noticed by now that Google is making it harder and harder to show up on page one without paying for it. There are now four ads at the top of the page, then a small map listing of only three (called the 3 pack) and then the natural or organic (free) listings below that. For most computer screens that means those free, organic listings below the map cannot be seen without scrolling down the page. What’s more is that Google is now making one of those three map listings a paid ad! So with all of that competition in your town trying to get into one of only three spots available, how do you get your listing into that map three pack? Well that’s where we come in. Power tip: make sure your listing is claimed and that any other listings you might find you claim as well so that you can get them all down to one listing for your practice and one for each Dr. In the practice. When we work with you on your maps marketing there are several factors that we look at to know how to get you into the map three pack. The most important is that your listing is a claimed and completed at 100%. That means your hours, your phone numbers, your website, your office photos, your team photos…basically everything must be completely filled out so that Google sees your listing as 100% complete. It also means creating what are called citations. These are places throughout the Internet where we are able to place your name, address and phone number so we can show google that your listing is 100% accurate and the correct one to be showing for that particular location and search term. The more complete the citations are, the better your chances of showing in the three pack. We will also be geo-modifying the images within your google map listing and in the citations we create as well as a few “secret sauce” areas that we found which work extremely well in getting you into that map listing. Geo-modifying images means that we place your name address and phone number within the image itself so no matter how or where Google sees something we create for you, it directly points back to your map listing. Another powerful piece to the puzzle is making sure that your website is designed exactly the way Google wants it so that we can get you into the three pack map listing. That means making sure the on page search engine optimization of your website is done completely and correctly. I would love to go into details on this part with you, but there is an awful lot of “secret sauce” that goes into the website setup that I can’t place on this web page. I would be happy to discuss it with you over the phone if you would like. 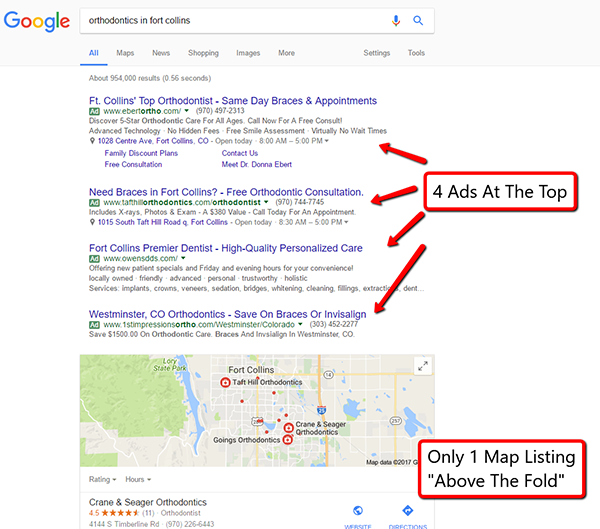 The bottom line, is there are steps we take to get your practice to show up on the first page of Google in the map listing for major keywords. To learn more about how this works and if it will work for you, give us a call of fill out the contact form below and we’ll get in touch as soon as possible. Remember, no matter how hard we try, if your online reputation is not at a 4.3 star rating or better, with new reviews coming in, you will not stay in the map three pack for long. For more information on your online reputation, get your free Reputation Score by filling out the super quick form below. It’s completely free and will provide you with information you can act on right away.